A few days ago I had a great card making evening with some friends! Card making can be a lonely hobby sometimes. I'm usually home alone at my desk and most of the social contact relating to it is done over the internet... That's why it's so wonderful to get together with other paper addicts and drool over each other's stash and techniques. ;) Never mind that it takes ages to pack my suitcase full of stuff and it can take weeks before I manage to unpack it - those evenings are real creativity kicks! 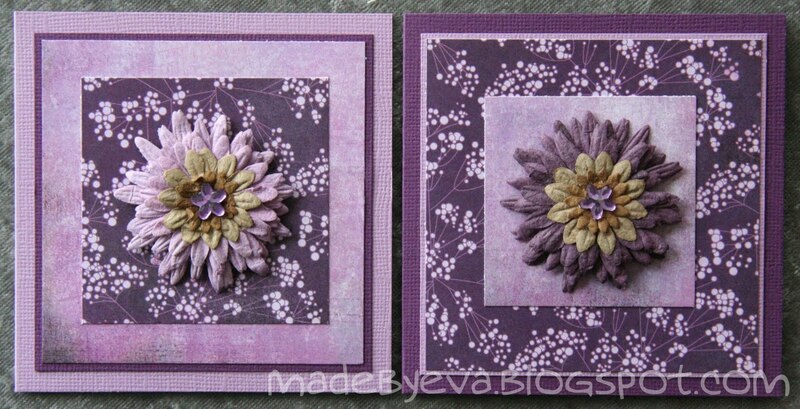 This time I made some mini cards, these are 10x10 cm. That narrows down the possibilities, but I liked the idea of having a simple design that fits any occation. A few of these in matching colours make a nice little gift. It's a great way to use scraps as well!